We are arriving in Hong Kong International airport at 6:30 am and would like to see the Peak first and head out to Ngong Ping 360 and take the cable car ride. I wanted to take the star ferry also if feasible. I need to reach the airport from Ngong Ping by 8pm. Thank you for writing THKA. Here's the route we've prepared for you which is also based on your request. From HK airport --> Take the airport express trains, 24 minutes trip to the city (read for a detailed info here). --> Take the Peak Tram to the Victoria Peak or "The Peak" (you can have your breakfast up in the Peak while looking the spectacular views that the Peak has to offer). --> At about 10:00am, you should go back down thru the Peak Tram. --> Take a taxi to the Star Ferry terminal (Bus No. 15C is also an option but it takes some time). --> Take the Star Ferry to Tsim Sha Tsui. Upon arrival, to your right is the Avenue of Stars - take some time in there also to see the Hong Kong Island in the opposite side (this is the place where to watch the Symphony of Lights during night time). --> Take MTR trains from Tsim Sha Tsui to Tung Chung MTR station (actually, Tsim Sha Tsui->Lai King->Tung Chung) a 39 minutes trip (HK$15.5). From Tung Chung MTR Station, find exit B to the Ngong Ping 360 terminal for a 25 minutes cable car ride to Ngong Ping terminal at Lantau (read detailed information and fine more attractions that Ngong Ping has to offer in here). After exploring NP 360, take the cable car back to Tung Chung and then take a Lantau taxi (blue) to the HK airport from Ngong Ping 360's Tung Chung Cable Car Terminal for just around 10 minutes ride at a cost of around HK$30. Comments for Quickest way from Victoria peak to Ngong Ping 360 and cable care ride. I bought a roundtrip ticket for ngong ping ride. Our schedule for peak tram at central station is 4pm. how to go lantau islan from victoria peak? Hi, just wanna ask how to go to lantau island from victoria peak? and how much the fare? and how the travel time from victoria peak to lantau island? I am arriving HongKong on August 10,2014 @ 11.30pm and leaving back to Korea on August 13,2014 @ 3pm flight. It would be great if you could advise me on a possible itinerary that allows me to visit Victoria Peak, Ngong Ping 360, Star Ferry and LanKwai Fong mainly. I have checked the weeather for coming 10 days in Hong Kong, it seems we might have to deal with the bad weather as it would be raining almost everyday of our trip. Please, kindly advise us on this and thank you in advance. HI, we will be arriving Hongkong on October 24, 5:45PM and Flight back is October 26, 6:20PM. Upon arrival, we would like to explore night spots to maximize our schedule.Is there a chance we can have a roundtrip to Macau? We would like to ensure also a Disneyland trip for our kids. What is the travel time from HK-Macau and vice versa? Also, if you have itinerary suggestion that we can squeeze in our schedule, that would be a big help. Thank you so much! Great site! Extraordinary insightful and helpful. Arrives at 10.40am, buy octopus card, iphone mobile sim card, gets map, etc and taxi to City gate. Leave luggages at locker, lunch and Ngong Ping cable car. Queue for cable car by 5.30pm and head back to TST to guesthouse. Check in and head to Yung kee and Lan kwai Fong. Breakfast at Australian Dairy company. Head to disneyland and stay till firework. Back to Mongkok around 9.30pm. Shopping and street food hunting. Last stop, Charlie Brown cafe. Breakfast at Tsui wah, the peak and wax museum. Lunch at city hall Maxim. Food hunt around Central. Head back to TST for shopping around Ave of star. Symphony of light. Dinner at Peking garden. Check out, breakfast at tim ho wan. Wong tai sin temple. Back to TST for shopping and food hunt. Collect luggages, check in at Hong Kong station. Eat in kau kee and ding ding tram to Causeway bay. Walk around and head back to HK station to take airport express. 1. If my itinerary is doable? 2. I have a lot of outdoor activities line up, how would be the Sept weather like? Would it rain whole day that no way I can spend it outdoor? 3. Read in some websites that Argyle centre closes at 10.30pm. Is it true? 4. How do I walk to Argyle centre from mongkok mtr exit d2? I suggest you purchase the Tower observation deck tickets for MOP 120 (includes Level 58 Observation Lounge and Level 61 Outdoor Observation Deck). You can enjoy the spectacular view of Macau plus the glass floor allows you to see the ground beneath your feet. hi! do you know anything about macau tower? would it be better take the tea set (snacks) in 360 cafe so that we can see the view of macau or just pay the entrance fee? thanks! I suggest you purchase the Octopus card since you will be staying for more than 3 days. An octopus card will cost HK$150, which is inclusive of a HK$50 refundable deposit and HK$100 stored value. So any amount left on the card at the end of your stay in Hong Kong is refundable along with the HK$50 deposit minus HK$7 for handling fee. i have another question.. should i buy the octopus card or the Airport Express Travel Pass $220*? Hong Kong weather right now is mostly cloudy, rainy and still cold about 12degC and actually, it's about getting to spring season (March to mid-May with an average temperature of 18degC to 27degC) from winter (mid-December to February). The weather temperature forecast on Thursday, March 15 will be 22degC to 25degC. Yes, HK Disneyland has baby strollers available for rentals. They've only one size and with a maximum weight of 15 kilograms @ HK$50 with HK$100 deposit and good for the whole day. hi! we'll be there in HK on Thursday, March 15, 2012. how is the weather there? is it still winter? do you know also how much a stroller rental would cost in HK Disneyland? will my 5 yr. old boy still fit in their stroller size? thanks for the many help. Here's for Macau attractions and travel details. Here's to read about Fernando Restaurant in Macau. Here's my suggested itinerary to maximize your HK trip. Hi, can anyone help me with my itinerary? can someone help me arrange my itinerary and suggest more place to go or foods to eat. and can you suggest a good portugese restaurant, is fernandos, a lorcha, litoral any good? March 16 3p.m. should i take the single day roundtrip star ferry cruise or the symphony of lights star ferry cruise? then where else and what else can i do after i watch the symphony of lights. march 17 ocean park then the peak,Madame Tussauds? march 18 disneyland then temple street night market? march 19 sik sik vyuen wong tai sin temple then citygate? and what to must eat foods should i try in HK? are there restaurants any good? Earl Grey at The Peninsula (Salisbury Rd)? my flight back to my country is on march 20 1:35 a.m.
First, L'Hotel Nina et Convention Center is a 5-star hotel located at No. 8 Yeung Uk Road, Hong Kong. A taxi from L Nina Hotel to the Hong Kong Macau Ferry terminal is about 18 minutes @ HK$110. A taxi from L Nina Hotel to the Lower Peak Tram terminal (The Peak) is about 27 minutes @ HK$145. Hi! would you know how much a taxi would cost from L Nina Hotel to the Macau Ferry terminal in Central? and from there to Victoria's peak also..thanks very much! Here's my suggested itineray to maximize your trip. *for the second option, you have to skip the fireworks and leave Disneyland park by 4pm. good day!! can you help me to do my 4d/3n itinerary. we want to go to disneyland to see the fireworks too, ocean park, macau, ngong ping 360, mongkok at night, Citygate, madame Tussauds, Victoria peak, avenue of stars and symphony of lights. our arrival is 8:30 morning and departure 5:30pm.. thanks. Can you please recommend us an itinerary on our trip to Macau and Hongkong? *Getting to The Peak from Ocean Park: Get back to Admiralty station and take the Tsuen Wan Line going Central and get off at Central station Exit J2 (3 minutes @ HK$3.8). Take a short walk crossing the Connaught Road Central direction where you'll find the bus stop for Bus no. 15C just outside the Hong Kong City Hall. Bus travel time is about 10 minutes @ HK$4.2 that will take you straight to the Peak Tram Station Lower terminal. From there, take the Peak Tram that will bring you up to the Peak. Take the Peak Tram back to the Peak Tram Lower terminal and adjacent to it you'll find the Peak Tram Bus Terminus. Take the Bus 15C that will bring you to the Central Ferry Pier Bus Terminus (10 minutes @ HK$4.2) close to the Star Ferry Pier no.7 and then take the Star Ferry going to Tsim Sha Tsui, 9 minutes @ HK$ 2.50. Take a walk along the TST promenade to visit the Avenue of Stars (free of charge) while taking the relaxing view the Victoria Harbour. Hope it helps. Enjoy your stay in Hong Kong! Hi This is a good site and quite helpful. I will be coming from China on March 29 lunch time and intend to stay until the 31st. Please advise best and economical place to stay nearest best sites to see and itinerary. I will be travelling alone so please suggest a safe place for me to stay. I would like to see most of the places within the tight sked and tighter budget. I would appreciate the map and rates for my budget. HK Airport to Mong Kok: take the CityBus A21. Travel time is about 40 minutes at HK$33.0. Or, take the Airport Express trains, interchange trains at Lai King station. Take the Tsuen Wan Line going to Central and get off at Mong Kok station. Mong Kok to Victoria Peak: Get into the MTR trains at Mong Kok station and take the Tsuen Wan Line trains heading toward Central. Travel time is 12 minutes at HK$9.9. Take exit J2 then walk 6 minutes towards the Peak Tram terminus. Victoria Peak to Avenue of Stars: Get back to the Peak tram terminus and board on the bus 15C to get to the Central Pier. Board on the Star Ferry to cross the harbor. The Avenue of Stars is adjacent to the Tsim Sha Tsui ferry terminal. To Disneyland: Get into the Mong Kok MTR station, take the Tsuen Wan Line train and get off at Lai King station. 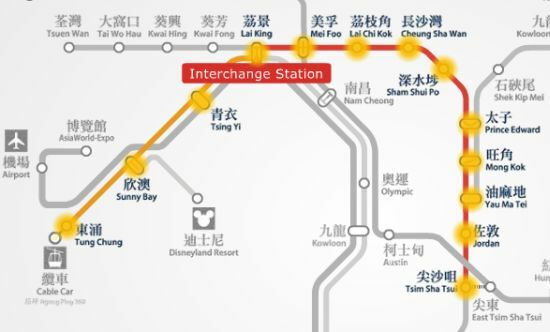 Interchange trains to the Tung Chung Line and get off at Sunny Bay station then interchange trains to Disneyland Resort Line that will bring you straight to Disneyland station Exit A (32 minutes @ HK$17). To Ocean Park: Take the Tsuen Wan Line trains going to Central and get off at Admiralty station, exit B. Upon exit, get on the special CityBus CTB 629 for about 25 minutes bus ride @ HK$10.6, an express bus travel between Admiralty (west) and Ocean Park (main entrance). To Ladies' Night Market: Get back to Mong Kok station and take exit D3. Follow directional signs. Here's to read Ngong Ping travel instruction and are found on the same link for your last day itinerary. There's alot of place that i would like to visit in hongkong. But im not too sure where is the place that is a must to go because my stay there is not long. I would like to know also estimated time that we would spend at a place. I will be arriving at hong kong airport on 25th February 2012 @1020HRS. & flight back will be on 28th February 2012 @1320hrs. My hotel will be at mongkok. Check in time will be at 2pm. A taxi from Hong Kong Macau Ferry Terminal to Hong Kong Gold Coast Hotel is about 35 minutes drive @ HK$250. Actually, you choose to take a ferry that will bound for China Hong Kong Ferry terminal at Tsim Sha Tsui. For detailed info about your hotel (location and map) including a taxi from hotel to ferry terminal or vice versa, getting to the hk attractions, please see this post or scroll up to the post dated "Sep 21, 2011" on this thread. I am reaching Hong Kong from Macau by ferry on 03rd Dec. I have booked my accommodation in Gold Coast Hotel. How far is this from ferry terminal and how much do have to spend by taxicab? Stroller is a big help for you and your little girl since you'd be having long walks most of the time. Don't worry about the transportation. Taxis have big luggage compartments and train platforms are very spacious so you can easily go on board. Also, most of the major attractions and shopping malls have lockers for rent. Hello. It's my first time to visit Hongkong & Macau with my 5 year old girl. I was wondering if I can bring a stroller for her since we wont' be traveling with my hubby to avoid hassle on carrying her if she gets tired. We're going to Disneyland * go shopping on the next day. Can you tell me if I bringing a stroller would be a big help or a hassle. thanks so much. Here's a sample itinerary to maximize your stay in Hong Kong and Macau. I strongly suggest you stay somewhere in TST or Mong Kok, Kowloon area. Day 1: Ngong Ping 360 --> Citygate Outlets shopping --> The Peak --> TST promenade to visit the Avenue of Stars and watch the Symphony of Lights show at 8:00pm --> street market shopping. Day 3: Museums and visit to some popular shopping malls in Hong Kong. Please follow this link to read info about Dragon hostel and your options getting there and also, getting to some of the popular tourist attractions you've mentioned. Nong Ping (morning til 2:00pm) --> Citygate Outlets shopping and dining (until 4:00pm) --> The Peak where you can reach the Sky terrace and Madame Tussauds (until 7:00pm) --> TST promenade to visit Avenue of Stars and watch the Symphony of Lights show at 8:00pm. Take Mong Kok MTR train Tsuen Wan Line and get off at Lai King station --> interchange to the Tung Chung Line trains and get off at Tung Chung station Exit B (32 mins @ 14.1) --> walk to the nearby NP360 cable car terminal --> take the cable car to Ngong Ping (24 mins @ HK$115 for round trip ticket - recommended). After exploring NP, take the cable car back to Tung Chung and walk to the nearby Citygate Outlets. Here's from Tung Chung to the Peak travel instruction. And from the Peak to TST promenade. hi! my sister and i decided to go on a do-it-yourself trip to hk (nov 24-27, 2011). will our itinerary on nov 26 be doable? suggestions are greatly appreciated. we need directions specially for the 26th. and also, since we're coming from mongkok, do we always have to go to TST first before going anywhere else? Could you please suggest an itinerary for a 3 day- 3 night visit to HK. We would like to skip Disneyland and Ocean park both. Want to include Macau though. I assume that you will be staying at Golden Crown Guest House. It's conveniently located at 5/F Golden Crown Court, 66-70 Nathan Road, Tsim Sha Tsui, Kowloon, Hong Kong. Nov 24: Spend the whole day at Disneyland. Don't miss the "Disney in the Stars" Fireworks at 8pm. Spend the rest of the night shopping at the Ladies' Night Market. *Getting to Disneyland from your hotel. *After HK Disneyland, go to Mong Kok (Ladies' Market) by MTR trains. Only 34 minutes at HK$16.6. Disneyland MTR station to Sunny Bay station, interchange to the Tung Chung line to Lai King station, then interchange to the Tsuen Wan line to Mong Kok. *From Mong Kok, take MTR trains to Tsim Sha Tsui station. Nov 25: Ocean Park --> Victoria Peak --> Avenue of Stars and watch the "Symphony of Lights" at 8pm. *Getting to Ocean Park from your hotel. Also found on the same link is getting to the Peak from Ocean Park as well as getting to the Avenue of Stars from the Peak instructions. Nov 26: Macau for the whole day. *Getting to Macau from TST. Hi, my friend and I will be arriving in hk on Nov 24 around 9am and will be back to Manila on nov 27 9:30am. It's our first time and would like our stay to be a memorable one! Appreciate your help for a sample itinerary. We'll be staying at Golden Crown Hotel and would like to explore HK in 2 days and macau for 1 day. thanks! Please refer to this page, Suggested Itinerary for 2D Hongkong/1D Macau Trip to give you an idea what to do in your short stay in HK and Macau. Dere's to read a day to day maximized HK itinerary suggestions that I think very applicable in your situation. And for budget accommodation in HK for some recommendation here. To reach Hong Kong from Macau is easy. Just take the ferries at Macau Ferry Terminal to Hong Kong Macau Ferry Terminal at Sheung Wan or to China Hong Kong Ferry Terminal at TST. Please read this post (scroll down to the post dated "Oct 24, 2011" on bottom of that page) for accommodation and itinerary suggestion to maximized your time while in HK. First, to know about your hotel location and the instruction on how to get from the hotel to Ocean Park and HK Disneyland, please click here (go to the post dated "Apr 26, 2010"). October 24, 2011: Ocean Park (quick tour until 4:30pm) ==> The Peak (until 7:00pm) ==> Symphony of Lights, show starts at 8:00pm ==> Mong Kok shopping (until 11:30pm) ==> back to hotel. From Ocean Park, take the bus 629 back to Admiralty station (25 mins @ HK$10.6) --> take a taxi to the Peak Tram Lower terminal (6 mins @ HK$20) --> take the Peak Tram up to the Peak (@HK$40 - round trip ticket) where you can visit the Madame Tussauds Hong Kong. From the Peak, take the tram back to lower terminal at Garden Rd --> walk to the nearby Peak Tram Bus terminus --> take the bus 15C to Central Pier (10 mins @ HK$4.2) --> walk to Pier no. 7 --> take the Star Ferry to Tsim Sha Tsui (9 mins @ HK$2.5) --> walk along the TST promenade to visit the Avenue of Stars and watch the Symphony of Lights. From TST promenade, get into the TST MTR station and take Tsuen Wan Line train to Jordan Exit A (3 mins @ HK$3.8) for Temple Street Market or Mong Kok Exit E2 (7 mins @ HK$4.6) for Ladies' Market. Back to hotel from Mong Kok, get into the Mong Kok MTR station --> take the Tsuen Wan Line train and get off at Tsuen Wan Exit B (26 mins @ HK$8.4). From hotel, walk and get into the nearby Tsuen Wan MTR station --> take the train and get off at Tung Chung station (29 mins @ HK$11.9) --> walk to the nearby NP 360 Cable Car terminal --> take the cable car to Ngong Ping (25 mins @ HK$115 - round trip ticket). From Ngong Ping, take the cable car back to Tung Chung --> get back into the Tung Chung MTR station --> take the train and get off at Sunny Bay station --> interchange trains to the Disneyland Resort Line train that will bring you to Disneyland Exit A (18 mins @ HK$11.9). From Disneyland to Shenzhen, get back into the MTR station --> take the train and get off at Sunny Bay station --> interchange trains to the Tung Chung Line and get off at Tsing Yi station Exit A (17 mins @ HK$11.9) --> upon exit, walk to the nearby Tsing Yi Bus Terminus and then take the bus KMB 279X and get off at Sheung Shui (MTR) Railway station (travel time is 39 minutes @ HK$13.2) --> get into the Sheung Shui MTR station --> take the trains to Lo Wu station (6 mins @ HK$19.9) for HK-Shenzhen border. Yes, I recommend you buy an octopus card. I will be traveling to hk with my family on oct 24-25, then shenzhen on oct 25-26 and macau on oct 26-27. I'm bothered with our hk itineraries. we will be arriving at 11am on 24th. we will be there thru a package from an agency that has compulsory morning tour on the 25th and the rest of 2 days is free for us to explore HK. i would like to know if the following list of hk attractions are doable upon our 2 half day free time and i would like to ask for the proper arrangement of attractions, the transportation from Dorsett far east hotel to one attraction to the other and back to the hotel. -ngong ping 360, giant Buddha, disneyland. would it be advisable to avail the octopus card for transportation purposes? I just want to ask, me and my family will have a vacation trip this coming November for 3 days. we'll be arriving around 8-9 pm in macau airport. we are planning to go straight to hongkong. but we don't have any idea how or what ferry to ride going to hongkong and going back to macau. we are planning to stay in hongkong for 2 nights. We wanted to shop, tour around the city and go to disney land. can you please help me? thank you so much! Hi, me and my fiancee will be at hongkong on March 19(10:00am) and departs on March 21(9:30am). I really have a limited time to tour hongkong so I need help so much help. Please provide me very efficient itinerary for our stay. And cheap accommodations too since most of the time we are out of the hotel. We are on a light travel, so from airport we can already start our tour and we plan to check inn late night, around 11:00 p.m. Thanks. Yes, if coming from the Peak, you can take a walk back to Central MTR station Exit J2 and take the Tsuen Wan Line train and get off at Tsim Sha Tsui station (6 minutes @ HK$8.1). Here's my itinerary suggestion for your HK visit on 7th Oct.
Mongkok --> Ngong Ping (morning til noon) --> Citygate Outlets (until 2:00pm) --> Wong Tai Sin (until 5:00pm) --> Sham Shui Po (you can stay there even until the rest of the evening) --> back to Mongkok. * Getting to Ngong Ping from Mongkok: Get into the Mong Kok MTR station --> take the Tsuen Wan Line train and get off at Lai King station --> interchange trains to the Tung Chung Line and get off at Tung Chung station Exit B (32 minutes @ HK$14.1) --> take a walk to the nearby NP 360 Cable Car terminal --> take the cable car to Ngong Ping (25 minutes @ HK$115 for round trip ticket). Explore NP. * Getting to Citygate Outlets: Take the cable car back to Tung Chung --> take a short walk and follow directional signs to the Citygate Outlets mall. * Getting to Wong Tai Sin from Citygate Outlets: Get into the nearby Tung Chung MTR station --> take the train and get off at Lai king station --> interchange trains to the Tsuen Wan Line and get off at Prince Edward station --> interchange trains to the Kwun Tong Line and get off at Wong Tai Sin station (40 minutes @ HK$14.1) --> take a short walk to Wong Tai Sin. * Getting to Sham Shui Po from Wong Tai Sin: Get back into the Wong Tai Sin MTR station --> take the train and get off at Prince Edward station --> interchange trains to the Tsuen Wan Line and get off at Sham Shui Po station (12 minutes @ HK$4.6). Coming from The Peak, Can I go back to Entrance/Exit J2 and take the MTR to Exit D1/D2 in TST? Hi, my friends and I will arrived at HK on the 6th of Oct and is planing to go Ngong Ping 360, City Gate, Wong Tai Sin & Sham Shui Po on the 7th of Oct. Here's to read topic discussion about 4 days itinerary in Hong Kong that I think something similar to the places of attractions that you've mentioned above. After reading that thread, if you have further specific questions, please come back here and post your message. And for our budget hotel recommendation. Hi! me and my two other friends are visiting hk on nov 6-9..we will be arriving at 9:55am...we wanted to explore hk attractions like disneyland, ocean park, cable car, peak tram, and others and a day in macau..our days in hk is so limited that we don't know how to arrange our itinerary. We are also looking for budget hotels. We are looking for a place accessible to our destinations..Please help us arrange our itinerary. by the way will be departing hk on nov 9, 6:30 pm..thanks in advance. Hong Kong Gold Coast Hotel is rated 5-star hotel located at 1 Castle Peak Road, Gold Coast, Hong Kong. TST: Pick-up and drop-off point at Bus and Taxi terminals of China Hong Kong City (Basement level, next to entrance of The Royal Pacific Hotel and Towers. Tsing Yi: Pick-up and drop-off point at Maritime Square, Tsing Yi MTR station Exit A1 (down one level). Tsuen Wan: Pick-up and drop-off point at Tsuen Wan Multi-Storey car park, Tsuen Wan MTR station Exit B, opposite to the Luk Yueng Sun Chuen Shopping Arcade. Take the hotel shuttle bus to Tsing Yi --> get into the Tsing Yi MTR station --> take Tung Chung Line train to Tung Chung station and take Exit B (16 minutes @ HK$11.9) --> walk to the nearby NP 360 cable car terminal --> take the cable car that will bring you straight to Ngong Ping (25 minutes @ HK$115 for round trip ticket). Note that Ngong Ping is a remote area in Lantau island that the most direct and efficient way to get there is thru the NP 360 cable car. Taxis can be taken from Hong Kong Gold Coast Hotel to any destination in town. The red cab flag fall is HK$18 for the first 2 km and another HK$1.50 is due for every additional 0.2 km. * Taxi from Hong Kong Gold Coast Hotel to HK Disneyland. About 24 minutes @ HK$185. * Taxi from Hong Kong Gold Coast Hotel to Ngong Ping 360 cable car Tung Chung terminal. About 32 minutes @ HK$245. * Taxi from Hong Kong Gold Coast Hotel to Hong Kong China Ferry Terminal (33 Canton Road, TST, Hong Kong). About 30 minutes @ HK$230. We'll be staying at HK Gold Coast Hotel in Castle Peak Bay, Tuen Mun from 10/20-10/23/11 then 10/23-10/24/11 at Disney Hotel. We are planning to do one day self-tour of Lantau on 10/21 to see the Giant Buddha, Ngong Ping, Po Lin Monastery, and whatever other attraction you may suggest. Also, we plan to go to Macau on 10/22, and Disney on 10/23 (staying overnight). Please suggest the best route and transportation. Roughly, how much will it cost we take taxi the whole trip? Please click here to read topic discussion (scroll down to the post dated "Jun 28, 2011" on that page) about the hotel location and getting there instruction to the most popular Hong Kong attractions like Disneyland & Ocean Park. Further down below on that page (post dated "Jul 01, 2011"), you'll find the location map of the Hong Kong China Ferry Terminal and a route direction in getting there. If taking the MTR trains from the Ferry terminal, it should be around 8 minutes walk to the Tsim Sha Tsui Exit A1 at Haiphong Rd --> take Tsuen Wan Line train and get off at Mong Kok station Exit D3 (7 minutes @ HK$4.6) --> walk 10 minutes to the hotel. As you notice that you need some long walks to get into the hotel so it should be a good choice to take a taxi specially if bringing along some luggage. It will be about 12 minutes drive @ HK@30 from the ferry terminal straight to The Anne Black YWCA Guest House Hong Kong. Hi there, it's me again thanks for your reply above. 1.) how to reach YWCA Hotel from Macau-China Ferry using MTR, since we will be coming from Macau? 2.) how to go to Disneyland & Ocean Park from YWCA thru MTR? 3.) From YWCA Hotel how to go to Macau ferry station, since we will be coming back to macau.? 1. Of course you can always use a taxi cab as your way of transportation to all the places you've mentioned. A taxi from HK airport straight to Avenue of Stars will cost around HK$250. 2. Yes, the Peak Tram opens @ 7:00am but the Peak Tower opens at 10:00am. In getting to Ngong Ping in Lantau by taxi from the Peak would cost around HK$300. Or, please click here to read another route version. Note: Ngong Ping is a kind of remote area in Lantau Island that the most direct transportation in getting there is thru the cable car from Tung Chung. 3. Yes, you need to have some HKD cash specially when taking taxis in Hong Kong. You can easily change your money at Money Exchanger booths at the HKIA arrival hall. 4. NO other public way, you should take the 268 steps in getting to the top of Tian Tan Buddha. 5. HK weather forecast for Sept 22 - 23 is rain with temperature ranging from 26degC to 29degC. 1. Can I get from the Airport to Harbor View/Ave of stars and finish it by 10am and then take a cab to Lantau? I'm not really interested in walking around too much and just want to see the view/skyline? I can skip the temple if time is short. 2. I think the peak tram starts at 7am..so, can I be done by 9am with victoria harbor view/tram and then take a taxi to lantau? 3. Do I need to have HKD cash to pay the taxi drivers or do they take credit cards or some prepaid pass? How much would be the fare from peak tram stop to lantau? 4. Also, is there a way to get to the top of big buddha without walking the steps? 5. How's the weather around September 22-23? Hi, the first thing you need to consider is that most of the HK tourist attractions opens at 10:00am except to those ones that are open to the public (free) like Avenue of Stars and the Victoria Harbour. So basically, you have only about 6 hrs from 10:00am until 4:00pm. Second, the no.4 in your tourist attractions list (Lantau/Monastery) will be classified into another route direction which make it not ideal to include in the first 3 nos. Option 1: HKIA --> The Peak (before 10:00am until 12:00 noon) --> Man Mo Temple (until 1:00pm) --> Avenue of stars / Victoria Harbour (until 3:00pm) --> back to HKIA (approx arrive at 4:00pm). Take the Airport Express train from Hong Kong airport station to Hong Kong station Exit A1 (24 minutes @ HK$100) --> take a taxi to the Peak Tram lower terminal (7 minutes @ HK$25) --> take the Peak Tram up to the Peak (HK$40 - round trip ticket) --> tram back to lower terminal --> taxi to Man Mo Temple (5 minutes @ HK$20 - see note below) --> taxi to Central Ferry Pier no. 7 (5 minutes @ HK$20) --> take the Star Ferry to Tsim Sha Tsui (9 minutes @ HK$2.5) --> stroll along TST promenade to visit the Avenue of Stars and enjoy the beautiful view of Victoria Harbour --> taxi to Kowloon MTR station (7 minutes @ HK$25) --> take Airport Express train to HKIA (21 minutes @ HK$90). Note: There are several Man Mo Temple in Hong Kong and the largest is located at 124-126 Hollywood Road, Sheung Wan, Hong Kong Island which is a suitable location for your route. Option 2: HKIA --> Ngong Ping (and the rest of Lantau tourist attractions), please click here to read the getting there detailed info (scroll down to the post titled "itinerary #2" on that page). 12 hour HK stopover help! My flight gets in at 6am and my connecting flight is at 6pm. I would like to see the city in the few hours I have in Hong Kong. Is it possible to see all of these in about 8 hours or so? I'll really appreciate if you can help me plan my trip. I'm traveling alone for the first time and have no idea how to get around the city. Thank you. Here's my personal itinerary suggestion based on your schedule and the places that wanted to visit. Nov 4: HKIA --> Tung Chung and stow luggage at Citygates (gateway to Ngong Ping) --> NP 360 cable car to Ngong Ping --> explore NP until noon - take cable car back to Tung Chung --> Quick shopping at Citygate Outlets and get your luggage --> HK Disneyland (stow luggage before getting into the park for convenience) --> explore Disneyland until 9:00pm to watch the fireworks --> get into hotel and check in. Nov 5: Hotel --> Admiralty MTR station Exit B --> bus 629 to Ocean Park --> explore Ocean Park until 4:00pm --> take bus 629 back to Admiralty --> short taxi drive to the Peak Tram lower terminal --> take Peak Tram up to the Victoria Peak --> explore the Peak until 7:00pm --> back to the Peak Tram lower terminal --> walk to nearby Peak Tram Bus Terminus --> take bus 15C to Central Ferry Pier --> take Star Ferry to TST --> stroll along TST promenade to visit Avenue of Stars and watch Symphony of Lights show at 8:00pm --> back to hotel. Basically, you've got 4 full days in HK plus an evening time during your arrival day. Oct 23: HKIA arrival --> take bus CTB A21 from Airport GTC and get off at 7th bus stop located at 630- 640 Nathan Road outside Bank Centre --> cross the Nathan road and follow directional signs for about 4 minutes walk to the hotel. Pop Hotel Hong Kong is a 3-star hotel conveniently located at no.950, Canton Road Mongkok, Kowloon, Hong Kong. About 4 minutes walk to and from Mong Kok MTR station Exit E1. After check in with your hotel, you can visit the nearby street market for bargain shopping, like the popular ladies' market or the temple street night market. Oct 24 - 27: You can read a daily itinerary suggestion in here. Here's the efficient way to travel from HK Disneyland to the Victoria Peak. Get into the Disneyland Resort MTR station and take the train to Sunny Bay station --> interchange trains to the Tung Chung Line and get off at Hong Kong station (last station) and take Exit A1 or E2 (31 minutes @ HK$21.7) --> take a taxi to the Peak Tram (about 7 minutes @ HK$25). Or, upon getting at Hong Kong station, walk to the adjacent Central station and take Exit J, then walk about 12 minutes to the Peak Tram Lower Terminal at Garden Road, Central, here's to view a walk route map. For your Macau trip, please read this post for a good topic discussion about it. Need your help in advising what will be the best arrangement for my travel in HK and macau this sept 16 & 17. on our day 1, sept 17, we plan to go to the big Buddha in the morning then to disneyland in the afternoon. luckily to get information from this site on how to get to Ngong Ping from Tsim Sha tsui and from Ngong Ping to disneyland. My question now is on how to get to Victoria Peak from disneyland. Also, would appreciate if you could give advise on my macau trip. Day 1 - NGOng PING in the morning then Disneyland in the afternoon then Victoria peak after disneyland. Day 2 - Victoria Harbor/Avenue of the Stars/Kowloon Tower then Macau whole day. Hi, We will be in HK on Oct23 1840H - Oct27 1930H. We are staying in Pop hotel, Kowloon. Please help us with our itinerary. We are very excited to go to HK Disneyland, Ocean Park and others. We will be arriving at 7:40am in HKIA and we will leave at 9:55pm in HKIA on Nov 6. Can you please advise me on our itinerary for 3 days in hongkong please. We want to visit Hk Disneyland,Victoria Peak, Ngong Ping 360,Avenue of Stars, Ocean Park and HK Museum, is it possible? Thank you very much for your respond ! Really appreciate ! I afraid it is not really a pleasant day for you to visit HK's open air tourist attractions specially along with the kids if weather condition is raining. Your alternate choice are those indoors like the museums and shopping malls specially the ones with kids playground, definitely you and your kids surely loves it. Please visit this page to read this topic "Recommendation for a place to keep the kids entertained" to know where those places in HK that is suitable for kids. Here's getting to TST from Macau travel instruction details and also, you can read information about museums located at TST area. Here's my personal itinerary suggestion tailored to the places of attractions you've mentioned to maximized your time while in Hong Kong. Day 1: visit to a couple of museums at TST area (optional, until 11:00am) --> Ocean Park (until 4:30pm) --> The Peak (until 7:00pm) --> Avenue of Stars / watch Symphony of Lights show that starts at 8:00pm with vantage point at TST waterfront (until 8:30pm) --> street market shopping at Ladies' market; Temple street night market. * Here's to read about how to get to Ocean park from Tsim Sha Tsui. * To read about efficient way to travel from Ocean Park to The Peak and then to the TST waterfront. * From TST waterfront to the most popular street markets in Kowloon area. Get into the nearby TST MTR station and take the Tsuen Wan Line train and get off Jordan station Exit A (3 minutes @ HK$3.8) for Temple street night market, or get off at Mong Kok exit E2 (7 minutes @ HK$4.6) for Ladies' market. * Getting to HK Disneyland from Ngong Ping (scroll down to the post dated "May 29, 2010" - "How about getting to Hong Kong Disneyland from Ngong Ping 360"). * Getting to Causeway Bay from HK Disneyland. Get into the nearby Disneyland Resort MTR station and take the trains to Sunny Bay station --> interchange to the Tung Chung Line to Hong Kong station --> walk to the adjacent Central station --> take the Island Line train and get off at Causeway Bay station Exit A going to Times Square shopping mall (travel time is 44 minutes @ HK$21.7). * And here's a recommendation for the most popular shopping malls at Causeway Bay. Wow! Thanks so much for your help (and reply). You don't know how I appreciate it. : ) More power to you and this site!!! Yes, a visit to Ngong Ping (could be until noon), shopping at Citygate Outlets (until 2:00pm), then to the Peak (until 7:00pm) is a great day itinerary for your HK tour PLUS a visit to the Avenue of Stars and watch the Symphony of Lights show that starts at 8:00pm. Here's how to get to Ngong Ping there from TST area. Please click here to read detailed instruction. Getting from Ngong Ping to The Peak (via Citygate Outlets at Tung Chung): Take the cable car back to Tung Chung and then walk to the nearby Citygate Outlets for shopping --> get into the Tung Chung MTR station --> take the Tung Chung Line train all the way to Hong Kong station and then take Exit A1 or E2 (29 minutes @ HK$18.8) --> take taxi for less than 10 minutes drive to the Peak Tram Lower terminal @ HK$25 --> take the Peak Tram up to the peak (HK$40 - round trip ticket). Getting to TST promenade from the Peak. Take the Peak Tram back to Lower terminal at Garden rd. --> walk to the nearby Peak Tram bus terminus --> get into the bus 15C (open-top) that will bring you to Central Ferry Pier bus terminus (10 minutes @ HK$4.2) --> walk to the nearby Ferry Pier no.7 --> take the Star Ferry to TST (9 minutes @ HK$2.5) --> walk along TST promenade to visit Avenue of Stars and that spot is a vantage point to watch the Symphony of Lights --> back to hotel (walking distance from that area). We will visit HKG on Sep 3-7. Since I am aware that it's still hot n raining in HKG, do you think it's advisable to go to Ngong Ping n the big Buddha during our stay? Or even Disneyland? I have no idea on how hot or how humid it is in HKG, but we are from Asian country with tropical climate. But i read many reviews tell how hot n humid HKG on summer. For your info, we are family with 3 little kids. I hope you'd like to answer my curiosity. Hello, is it advisable to go to the Peak AFTER NGONG PING? We are planning to go to Citygate outlet mall in the morning, do some shopping then head to The Peak. What's the best way to and from our hotel in TST? Will be coming to HK from Macau this coming Oct.27-30,2011 could you pls. suggest an itinerary for us including its direction from one place to another. Here's our flight details. * Arrival at Macau : Oct.27 in the afternoon, we're planning to go to HK the ff. day - Oct.28, earliest trip from Macau to HK and that would be the start of our tour, we will be booking our room somewhere in TST. * pls.advise how to go to TST from Macau? * the ff. are the places we wanted to visit in HK, for 2 days since we will be going back to Macau on Sunday morning, therefore we only have 2 days to explore HK. Pls. help us to maximize our time to visit these places. Then on Sun - Oct.30 in the morning will be going back to Macau, pls.advise how to go back from Hongkong to Macau? Aug 13, Sat: From HK Airport take the Citybus CTB A21 to TST area. I'm sure you can easily find a hostel in Mirador Mansion. After check in, walk 6 minutes to the Star Ferry Pier and take the Star Ferry to Central (9 mins @ HK$2.5). Walk to the nearby Central Pier Bus terminus and take the bus 15C to the Peak Tram Lower terminal (10 mins @ HK$4.2). Take the Tram up to the Victoria Peak (suggest you purchase the round trip ticket @ HK$40). From the Peak, follow the same route (in reverse order) when getting back to TST promenade where you can visit the Avenue of Stars and watch the Symphony of Lights show that starts at 8:00pm. After the show, get into the TST MTR station nearby and take the Tsuen Wan Line train to Mong Kok station (7 mins @ 4.6) and then take Exit E2 and follow direction to the Ladies' Market for about 4 minutes walk. Jade market is only up to 5:00pm. * The Ngong Ping 360 Cable Car was already back in operation since end July, 2011 from maintenance scheduled downtime. It is a remote part of Lantau Island and the most direct and efficient way to get there is thru the cable car. Get into the Tsim Sha Tsui MTR Station, take the Tsuen Wan Line trains towards Tsuen Wan and get off at Lai King Station then change to Tung Chung Line/Disneyland Resort Line trains towards Tung Chung and get off on that last station (HK$15.1, 34 minutes) and take Exit B. Walk 4 mins to the Tung Chung Cable Car Terminal and then take the Cable Car (25 minutes @ HK$115 round trip ticket) ride to Ngong Ping, Lantau Island. * Getting to HK Disneyland from Ngong Ping. Take the Cable Car back to Tung Chung terminal and get into the Tung Chung MTR station. Take the Tung Chung Line trains and just get off at the next station, Sunny Bay station. Interchange trains to the Disneyland Resort Line that will bring you straight to Disneyland (18 minutes @ HK$11.9). * Places of interest in Tung Chung area includes the popular Citygate Outlets. To read about my personal itinerary suggestion about this topic, how to get there and hotel location map, please read this post. Hi! my friends and I will arrive in HK Aug 13, 10am and will be leaving HK by Aug 15 at 9:45am, we suppose we could easily find hotel or inn in TST before 1pm on Aug 13. I made a rough itinerary and may you kindly check in order to maximize our time. Aug 13 - 1-4pm- The Peak, madam Tussauds, Victoria Harbour (with Avenue of Stars, HK skyline & symphony of lights), and the remaining evening for night markets (ladies & jade). If we go to ngong ping 360 is the cable car already operational? with the itinerary I made maybe we could squeeze some other places to go? My family will be arriving in HK on Aug 5 at 1Pm and will be staying in a Hotel at citygate. Upon arrival we are planning either go to the outlet mall or Victoria Harbour in the late afternoon. If we do go to Victoria Harbour to see the symphony of light on the 5th will it be too tiring for us to spend whole day on Aug 6 in Disneyland for my 5 yr old daughter? We would like to squeeze a trip to Ngong Ping cable, Victoria Peak & Victoria Harbour on Aug 7 and rest on the 8th before our flight. Please help me to plan our trip with less stress and more on an enjoyable one. With this, please indicate a more reasonable form of transportation, which would enable us to enjoy the scenery yet not to spend too much on travel time. You can get the HK$30 Museum Pass when you arrive at the Museum entrance but remember that it is only available to the promo-participating museums. Hi! Where can we buy the HK$30 Museum Pass? The luggage lockers for rent in Citygate Outlets has a maximum size of 22 X 31 X 35 inches (LWH) @ HK$20 / 2 hours. If you think it is not enough then you can rent the luggage lockers in HK Disneyland entrance with unlimited size for whole day @ HK$60. In this case, you may go straight to Disneyland from HK airport to store your luggage (considering also that Disneyland is your final tourist spot destination on that day) and then back to Tung Chung to take the NP cable car to Ngong Ping. Here's to read more details about luggage lockers at Citygate Outlets in Tung Chung and HK Disneyland. * Aug 14: Ocean Park (morning until 4:00pm) --> Victoria Peak (until 7:00pm) --> Take the bus 15C to Central Pier --> Take the Star Ferry to Tsim Sha Tsui (TST) while taking a look at the magnificent Victoria Harbour view --> walk along TST promenade to visit the Avenue of Stars and watch the Symphony of Lights show that starts at 8:00pm ?-> HK nightlife, you may take the Star Ferry back to Central to visit Lan Kwai Fong. What you read about Tsim Sha Tsui is right, in fact the place is known as the heart of the city, a transportation hub, good place for dining and shopping so that is why TST area is highly recommended place to stay for tourist. * A full day Hong Kong tour - for detailed instruction in getting to Tung Chung then Ngong Ping from HK Disneyland. Day 2: HK Disneyland (whole day and wait until 8:00pm to watch the Fireworks). Day 3: Ngong Ping 360 --> Citygate Outlet at Tung Chung for shopping and dining. * Wanchai Computer City - MTR Wanchai station exit A4. * Mong Kok Computer Centre - MTR Mong Kok station exit E2. * Golden Computer Arcade and Golden Computer Centre - MTR Sham Shui Po station exit D2. * Times Square - MTR Causeway Bay station exit A. * Sai Yeung Choi Street South - MTR Mong Kok station exit D3. Please click here to read some of our recommendation for a short stay in Hong Kong. You may add more specific questions about these itineraries. We are visiting hong kong from 13-17 august. We are landing at around 7 am in morning. Can we find some good place (lockers) to keep our stuff till afternoon/evening? Is tung chung terminal luggage store room is good enough? * Aug 15 - Repulse Bay - Stanley Market - famous Street Market shopping- HK nightlife. We would be staying in Tsim Sha Tsui area. We have read about Tsim Sha Tsui area that it is best area for tourist. Is that right? Please suggest whether this is ok or need some modifications. I'll be in Hong Kong with my family for 5 days from the 6th to 10th of July. We'd like to plan Ocean Park and Victoria Peak on Day 1, Disneyland on day 2. Ngong Ping 360, the symphony of lights laser show, repulse bay and the ladies market are some places we'd like to visit too. Still wondering how to plan it. Hi! I need your suggestion as we have 11 hrs layover. We will be arrive at 11:30 am and departure at 10:30 PM we would like to see some places in HK can you please tell us what is a better route to be able to return to HKIA on time for our departure. We would like to see and experience the following: The Peak, Disneyland, Cable Car and the Buddha then go back to HKIA at 8:30PM. Basically you only have 3 days in Hong Kong so here's my personal itinerary suggestion. Day 1 (Sept. 5): HK Disneyland --> Shopping at CityGate Outlets in Tung Chung. Day 2 (Sept. 6): Ocean Park --> The Peak --> Avenue of Stars and Symphony of Lights at TST promenade --> Theme street market shopping. I suggest you read the topic discussions below that are related to your HK - Macau trip. * 4 days itinerary in HK and a day in Macau? Re: 6 hours layover - is HK Disneyland possible? Your time is a bit tight for Hong Kong Disneyland as the park offers a full-day activity but it is doable. I suggest you take a taxi considering you're traveling along with kids. A taxi between HK airport and Hong Kong Disneyland will take about 40 minutes drive and cost around HK$110 (for one-way trip). So, you can allocate 1.5 hours for a return transportation and that means you have at least 4 hours to explore the park. My other suggestion just to be safe from being left in your next flight is to stay at the airport and do shopping. The popular Citygate Outlets mall is just 10 minutes by taxi from the airport. 6 hour layover - is HK Disneyland possible? We have a 6 hours layover from 1:30 to 7:30pm. I'm traveling with 3 kids - is a quick trip to Disney possible? Your itinerary is fine for me. Here are some additional information that I need to mention. * In getting to Ngong Ping from Tung Chung. A taxi will cost around HK$200 for about 35 minutes drive but you also have a bus option, Bus No.23 (48 minutes @ HK$17.2) from Tung Chung Town Centre Bus Terminus (close to Tung Chung MTR station or adjacent to the Citygate Outlets) to Ngong Ping Bus Terminus at Ngong Ping. * Mong Kok to Tsim Sha Tsui (TST) station by MTR, 7 minutes @ HK$4.6 per person, so it is also ideal to take a taxi instead for less than 10 minutes drive at HK$25. * To Serenade Restaurant. East TST MTR Exit L4 (much closer) or TST MTR Exit F.
* Shopping at Argyle Centre which is located at 65 Argyle Street, Mong Kok, Hong Kong. It opens daily from 12:00 noon to 11:30 or actually until midnight. For other Mong Kok popular shopping malls, please click here for more information and opening hours. 3pm: From Peak, take cab to Causeway Bay (CWB) - Yee Shun Dairy for teak break. Pls help to check my plan. Arrival 21-24 June 2011 with 5 Adults of 3 medium size Luggage. 8pm: Take Tung Chung MTR to Lai King MTR then Mongkok with 3 Luggage. Hi! can you help me set an itinerary tour in Hongkong? this is our first time to visit. We want to see Disney and Ocean Park and other tourist spots, can you pls help me, we will b arriving 9pm of Sept. 4, 2011 then we our departure date is Sept. 7 and time 7pm flight. Thank you! Hoping for your response! Yes, I afraid the cable car service at Ngong Ping 360 is still down when the time you get in Hong Kong. Just in case that will be the scenario then here are your options to get into Ngong Ping from Tung Chung area. You can take the New Lantau Bus (Bus No.23) for about 48 minutes bus trip @ HK$17.2 from Tung Chung Town Centre Bus Terminus (close to Tung Chung MTR station or adjacent to the Citygate Outlets) to Ngong Ping Bus Terminus at Ngong Ping. It takes 37 bus stops to get there. I am going to HK from 20-23 June, 2011. Planning to ride the NP360 cable car. But then I found in their website that it is under maintenance starting from 23 May 2011 for about 1 month. Thus I wish to clarify that is it more than 1 month or less than 1 month, since my time spends in HK is just nearly 1 month after that. If I cant get the cable car ride, is it very time-consuming to take the bus? and how about the taxi fare from Tung Chung to the Giant Buddha? Thanks for your information. Re: Hongkong for 5 days and 4 nights. If you have any specific question about it then just hit the "add comment" button below to write it down. Getting a short stay VISA at mainland borders like Hong Kong - Macau or Hong Kong - Shenzhen borders has been suspended since the China 2008 Olympic games unless you have a Hong Kong ID. Mainland China visitors are advised to secure their VISA in the country of origin before their trip to avoid any problem. Hongkong for 5 days and 4 nights. We will be visiting HK this coming August and staying for 5 days 4 nights. We will be in Hongkong on 13th August until 17. We will be arriving at 7:00am in HKIA and we will leave around at 7pm in HKIA. Can you please advise us on our itinerary in Hongkong and Macau? Will it be possible to get visa for Shenzhen at China border? We would like to travel that city for a day. Re: Night time layover in Hong Kong. I would recommend along the Tsim Sha Tsui promenade if you want to experience a wonderful night in Hong Kong. This place is one of the most popular tourist spots in Hong Kong specially early evening until midnight where you can visit the Avenue of Stars and watch the nightly sound and light show at 8:00pm, "The Symphony of Lights" crossing the Victoria Harbour. A good place to relax and unwind from stressful day event. The Symphony of Lights in Hong Kong! By Bus: Take the CityBus CTB A21 from Airport bus stop no.1 (Ground Transportation Centre) and get off at bus no.15 (Salisbury Road, Tsim Sha Tsui, opposite to the New World Centre) for 66 minutes bus ride @ HK$33 then take a short walk to the TST promenade and Avenue of Stars. Bus service hours is from 5:30 am until 00:00 midnight. By Airport Express + short taxi drive: Take the Airport Express trains from Airport station to Kowloon station for 21 minutes @ HK$90. Then take a taxi to TST promenade area for about 12 minutes drive @ HK$25. This would be the fastest way to travel but quite expensive. Read more discussion about from HK airport to Tsim Sha Tsui. Another place which is very popular for nightlife in Hong Kong is Lan Kwai Fong if you want to morning the night! This place is a walking distance from Hong Kong station for Airport Express trains where you can quickly get back to HK airport within 24 minutes @ HK$100. Also, there's NO problem in getting a sleep at the HK airport. You can always find lot of people doing it right there waiting for their connecting flights on the next day. HK airport is very clean and also has a free wi-fi internet connection for your notebook computer or smart phones. Night time layover in Hong Kong. Our flight arrives HKIA @ 7 pm and our flight departs the following morning @ 7 am. I checked the hotel rates near the airport and they are all over $100 so I'm convinced it's not worth checking in at the hotel. We're thinking of going around HK, have dinner and go back to the airport at midnight. Not sure what to do w/ the sleeping part (yet) but I would appreciate any suggestions on what we can see in HK at night time? Please find itinerary suggestion on the above topic (Sightseeing information in Hongkong), any of those will definitely applicable in your 11 hours layover in HK. Let me know if you need more clarifications or if you have further questions. 5 hours layover in Hong Kong is a bit tight but any of these itinerary can be done. Itinerary 1: Shopping at the popular shopping mall located at Lantau Island and a proximity to the HK airport. Itinerary 2: Ngong Ping 360 cable car ride and the popular Lantau Island attractions. * Ngong Ping 360 Cable Car to Ngong Ping = 25 minutes @ HK$80 one way or HK$115 return (recommended). Total travel time from HK airport to Ngong Ping by taking the cable car is about 35 minutes or we can give a time allowance of 2 hours traveling time including your return trip to the airport. So basically you still have about 3 hours to spend at Ngong Ping attractions. Option: A taxi straight to Ngong Ping from HK airport will take about 40 minutes drive @ HK$175. Itinerary 3: Sightseeing at the Victoria Peak for a 360 spectacular view of Hong Kong skyline. * Airport Express train from Airport to Central (via Hong Kong) station = 24 minutes @ HK$100 single journey ticket or @ HK$180 for return tickets (recommended). * Peak Tram straight to the Peak = 7 minutes @ HK$28 one way or @ HK$40 for return (recommended). Total travel time from HK airport to the Peak is about 36 minutes or we'll budget a 2 hours traveling time including your return trip to the airport. So basically you still have about 3 hours to spend at the Peak. Option: A walk from Central to the Peak Tram station can be read in here including map. How to get to the Victoria Peak tramway from the HK Airport. If you hesitate to do any of the above itinerary and want to make sure that you can make your next flight, I suggest you just stay at the airport premises for shopping. Also, HK airport has a free Wi-Fi internet connection for your notebook computer or smart phones. I am Indian now I am staying in south Korea and i am going to India via Hongkong. I have 5hrs time in Hongkong. I need to plan for a sightseeing so please suggest me some good places near to airport. Re: HKIA to Mong Kok then back to Tung Chung. HK airport --> Tung Chung --> Ngong Ping (attractions at Lantau island) --> back to Tung Chung --> MTR trains to Mong Kok and YES, this is very doable. Actually you can rent and leave your luggage at Citygate Outlets in Tung Chung. Big size storage lockers has a dimension of 22" X 31" X 35" @ HK$20 per two hours while the small size storage lockers has a dimension of 15" X 31" X 15" @ HK$10 per two hours. Proceed to Ngong Ping by taking the cable car (24 minutes) or take the bus NLB 23 or NLB 2 from Tung Chung Bus Terminus (Terminal) to Ngong Ping Bus Terminus (Terminal) at Ngong Ping. Total bus travel time is 68 minutes @ HK$32.2 for about 40 bus stops. From Ngong Ping, take the Ngong Ping 360 Cable Car back to Tung Chung. Upon arrival at Tung Chung Cable Car terminal, proceed to Citygate outlets for shopping and then get your luggage. As you noticed that the most direct transportation between Ngong Ping and Tung Chung is only through the Cable Car. Taking a bus or taxi will take time as it will go around almost to the whole Lantau Island. So it is practical to get a return ticket for the Ngong Ping 360 @ HK$115 (HK$80 for one way). June 20: Upon arrival at HK airport, I suggest you should go directly to your hotel to check-in and leave your luggage. Stay somewhere at Tsim Sha Tsui area, the place that is known to be the heart of the city where transportations, shopping mall and signature shops, bar and restaurants are in proximity. Below TST map shows the location of Mirador Mansion, Chungking Mansions and nearby point of interest mentioned above. Ocean Park --> Victoria Peak (where you can visit Madame Tussauds) --> Victoria Harbour (Avenue of Stars and Symphony of Lights). To see how to get there instructions including MTR route map to Ocean Park from Tsim sha Tsui area and then to the Victoria Peak (scroll further down below to that page "Peak from Ocean Park", please click here. June 22: I recommend this itinerary = Ngong Ping --> Disneyland --> back to TST for Street Market shopping. This itinerary is being discussed in here including the instructions in getting there. June 23: Hong Kong --> Macau attractions (whole day) --> HK Airport. All information in getting and touring around to Macau for a day trip from Hong Kong, please click here. I have 11 hour layover in Hong Kong. I'll arrive 6:30 AM and will have flight 5:30. Please suggest what are the must see attractions of Hongkong. How can I plan it? How much can I cover it. Is there any guided tour provided at the airport? See this Ngong Ping 360 location map and nearby attractions for your reference. From the Giant Buddha (Ngong Ping 360) to Tai O is about 14 minutes at 7 km distance. Taxi fare is about HK$85. While from Tai O to Tung Chung MTR station is about 35 minutes taxi drive at 23 km distance. Taxi fare is about HK$120. Taxis in HK are color coded so you should see more and take the color BLUE taxis which serve all destinations in Lantau and the airport area. You may also see RED taxis (urban taxis) that serve all destinations throughout Hong Kong while the GREEN taxis are only allowed at New Territories (N.T.) and specific roads in Lantau. Note that you need to pay an extra HK$5 for each luggage that you put into the taxi baggage compartment. Hope this help, have a safe trip and enjoy your stay in Hong Kong! We plan to take cable car to Ngong Ping 360. After visit the giant Buddha, we take taxi to Tai O.
I'd like to know how much for the taxi charge from Ngong Ping 360 to Tai O? Also, how much from Tai O to Tung Chung MTR station? We'll be visiting HK this coming June and staying for 5 days 4 nights. My question would be, is this doable on our 1st day? I have two options here, please advice what's best. I'm Ms. Aimee! me and my 3 friends are going to have our vacation in Hongkong and Macau. June 22: Ngong ping 360,Disneyland- how to get there? or this should be on June 21? June 24: Departure to Philippines @ 10:40am. What Ferry should we ride to go directly to HK airport and what time the earliest ferry Macau-HK airport. I also want to insert in our itinerary the symphony of lights, Avenue of Stars, Ladies' market and nightlife (where is the best place?). also with this hectic schedule would it be advisable to stay in different hostels in the nearest place of our destinations. We only need cheap but safe hostels to stay coz anyhow we won't be sleeping that long at least we can leave our things while roaming around and take a bath. Kindly recommend where we can dine, a buffet perhaps near our destinations. Do we really need an octopus card? Please I need ur guidance. Thank you. There is NO children's play area at the HKIA. The airport only offers FREE Wi-Fi connectivity for your Notebook computers or Smartphones. There are also free internet stations in some places of the airport being provided to the waiting passengers. are there any play areas for children at the airport? do i have to pay to use them ? If yes would you please tell the charges? Sorry but I afraid there's no such facilities at Hong Kong airport that is free for children. * "Bits of Old Hong Kong" exhibition where history of Hong Kong is being presented to travellers thru collection of photos. Located close to Gate 36, Departures Level, Terminal 1 and Transfer Area E1, Arrivals Level, Terminal 1. * The Cultural Hong Kong giving travellers a visual introduction of Hong Kong's local cultures and customs which is being held close to Departure Gate 35. * Wood and Metal Sculptures a variety of sculptures made by young local sculptors are on display at East Hall, Level 7, close to the food court. Thank you so much for answering all my questions & that too with such precision. Can you also tell me what facilities are provided for children, free of cost so that I can easily spend my 4 hrs layover at the airport. Re: Vegetarian Meal at HK airport. There's no such restaurant in the Hong Kong International Airport that offer or specialized vegetarian foods but I know that some of them could be able to serve you upon request. * THE GREEN MARKET that serving healthy green salad, soup noodles buffet and other food that is ideal for health-conscious travellers. It is located at Arrivals Meeters & Greeters Hall, Level 5, Terminal 1 (tel no. +852 2261 0890). * Cooking Mama 360 also located at departures east hall, level 7, terminal 1 (tel no. +852 2261 2663). Standard price for a single meal at HKIA is about HK$60. Vegetarian Meal at HK airport. Please tell me where can I get vegetarian meal at Hongkong airport, no egg or chicken stock & if possible how much would a meal cost? Are there any Indian meal options? Also, what facilities are provided free of cost for children at the airport? Your time is quite tight but it is doable. Victoria Peak is about 30 to 35 minutes taxi drive from Hong Kong International Airport at HK$330 for one way. To know where the taxi stand at HK airport, please click here to see the map and click the markers. I have a 5:25 hr layover at Hongkong airport. will be travelling solo with 2 toddlers. Can I visit Victoria Peak in 3 hrs & come back? Also, if I can how much would the whole trip cost? Also, can I take a taxi from the airport for the peak? How much would that cost? Actually, you can easily purchased your Ngong Ping Cable Car tickets at any of the two Ngong Ping terminals. In your case, you can get it at Ngong Ping Cable Car Ngong Ping Terminal. It is about 8 minutes walk from the Ngong Ping Bus Terminus. Would just like to know where can we purchase Ngong Ping Cable car tickets. Since we wanted to take the bus ride to Ngong Ping Village and take the Cable car ride back to Tung Chung. Here's a bus route option from Tung Chung Town Centre to Ngong Ping village. You can take the New Lantau Bus (NLB) bus No.23 from Tung Chung Town Centre Bus Terminus (close to Tung Chung MTR station or adjacent to the Citygate Outlets) to Ngong Ping Bus Terminus for approximately 48 minutes bus travel time. For more information about how to get to Tung Chung and Ngong Ping, please click here. I wanted to go to Ngong Ping village early in the morning by bus and take the cable car back to Tung Chung. Is that possible? Since we could be in Tung Chung around 7am and the cable car opens up at around 10am, we'd like to take the bus instead. Can you help us on this? In order to help you plan your itinerary, here's an overview of the locations you've mentioned above. Tin Sui Wai is located somewhere at north-west of New Territory area. Although it is quite far from Kowloon area, still the MTR trains is the most efficient form of transport from that area to almost everywhere around the city. Here's a suggested itinerary for 2Days Hongkong and 1Day Macau Trip, see for yourself here. Need help with an itinerary for this. Our hotel is in Tin Sui Wai, New Territories. Is this doable for a 3 days trip? Yes, the Junk Boat is visible in the victoria harbour specially when you travel between Tsim Sha Tsui and Central Ferry Pier. It is always very spectacular to see it at night. Bus 2 from Mui Wo Pier Bus Terminus to Ngong Ping Bus Terminus travel time is about 45 minutes @ HK$17.2. It is quite slow as it has 30 something bus stops but you'll definitely enjoy and love the beautiful scenes along the way. Wow, your suggestions sounds great and helpful, I really appreciated it. It will definitely help us to maximize our time and provide us with the best of Hong Kong. By the way can we see the Junk boat around both piers? also, how long will it take for us to reach Ngong Ping from Mui Wo Bus station? We're going to go there on Friday, hope it will not be very crowded. Considering that you would be ready to go from your hotel at 7:30 or 8:00 am on that day, that would give you enough time to get into Disneyland (opens at 10:00 am) then to Ngong Ping in the afternoon then back to your hotel. But, if you prefer to go to Disneyland in the afternoon and stay until evening to see the "Disney in the Stars" Fireworks at 7:00pm then we'll start your journey towards Ngong Ping first. This route is going to be a very scenic journey. From Tsim Sha Tsui (TST), take the Star Ferry to the Central Ferry Pier (no.7), 8 minutes @ HK$2.5. Walk to the adjacent Pier (no.5) and take the Ferry to Mui Wo (Lantau Island), 50 minutes @ HK$13. Upon arrival at Mui Wo Ferry Pier, look for the nearby Mui Wo Bus Terminus. Take the bus NLB 2 that will bring you to the Ngong Ping bus Terminus (just right at the center of Ngong Ping attractions like the Giant Buddha and also, close to the Ngong Ping 360 Cable Car Terminal). Take your time in the must-see attractions and shopping in there till afternoon. Hope this will help you plan your trip ahead. Enjoy your stay in Hong Kong! To see the fireworks display in Hong Kong Disneyland is very doable in your 2 days stay in HK. Disneyland Park hours is 10:00am - 7:00pm and 8:00pm on peak park day (like Sundays or any other special days), Feb 1 & 2 park schedule is not available yet and to be announced soon. The "Disney in the Stars" Fireworks will start at the end of park's hours (usually starts at 7:00pm). This spectacular fireworks show transforms the sky above Sleeping Beauty Castle into a stunning evening spectacle for your spectacular and unforgettable Disney experience. Do not worry about your location specially if it is somewhere in Kowloon, there's is always the MTR trains that is very efficient way of transport in HK. For your furthere reference, here's a suggested itinerary for 2 whole days in hongkong and 1 day in macau that you can read in this page. Hi, we will have our tour in HK on February 1 & 2, 2011 and I want to see the fireworks display in Disneyland. Is it possible to happen? I really need an HK itinerary for 2 days. We will be checking in at Kowloon City (Oriental Riverside). A quick response is highly appreciated. It is my first time to go in HK. (^_^) THanks! Most attractions in HK will start at around 10:00am. The Peak Tram opens from 7 am to 12 midnight (Mon - Sun & Public Holidays). The Peak Tower opens from 10 am to 11 pm (Mon - Fri) and from 8 am to 11 pm (Sat, Sun & Public Holidays). The Peak or Victoria Peak best access point is through the Peak Tram which station is located at Garden Road, Hong Kong Island, Hong Kong. Considering that you're in a group, taking a taxi from Hong Kong airport to the Peak Tram station is recommended, HK$300 - 30 minutes. Also, you can take the Airport Express trains from airport all the way to the Hong Kong station, 24 minutes - HK$100 / person, then walk to the adjacent Central station and take Exit J2. Upon exit, walk up to the ground level, you'll see the Chater Garden, turn right and cross Queen's Road Central, and make your way up to the Garden Road. You'll see some famous HK landmarks like the Bank of China Tower, Citibank Plaza on your left and St John's Cathedral on your right. Make a little left upon reaching to the Lower Albert Rd intersection to the Peak Tram terminal, walk time about 15 to 20 minutes (see walking route map here). Upon arrival at Tsim Sha Tsui, walk along the Tsim Sha Tsui promenade until you get to the Avenue of Stars. Look for the MTR trains Tsim Sha Tsui station Entrance / Exit (J) and take the Tsuen Wan Line trains towards Tsuen Wan and get off at Mong Kong station Exit E2, 7 minutes - HK$4.5. Please click here to know how to get to the Ladies' market. Take a taxi from Disneyland to the airport for about 20 minutes. Hi, we will arrive 7am in Hong Kong, and we want to visit Victorias Peak, ride the Peak Tram, ride the Star Ferry, shop in Ladies market & tour HK Disneyland. Can you please suggest which place should we go first? How to get there by MTR, the time we should allot for each place? we want Disney to be our last stop, is this doable? thanks for all the replies! Re: How to get to Hong Kong Ngong Ping 360 from Tsim Sha Tsui? The most efficient and convenient way on how to get to Ngong Ping 360 from Tsim Sha Tsui area is by taking the MTR trains (38 minutes / HK$ 13.5). Look for nearest MTR station in your area (don't worry, you won't find it hard to see those MTR station signs as most areas have it). Assuming that you're taking the Tsim Sha Tsui MTR station, take the MTR Tsuen Wan Line going towards Tsuen Wan and get off at Lai King station - interchange trains to the MTR Tung Chung Line towards Tung Chung and get off to that last station. Take the Exit B and look for signs going to the Ngong Ping 360 Cable Car Terminal. You can read more alternate routes in here in here if you want to go to Ngong Ping by not taking the cable car. We suggest that you go first to Ngong Ping 360 as the must-see attractions in that place were best viewed at day time (you may follow the direction as already stated above on how to get there). And then head back to Victoria Peak late in the afternoon as it is a perfect place to see Hong Kong during early evening. Please click here to read more on how to get to Victoria Peak. From Tsim Sha Tsui- Victoria Peak first or Ngong Ping 360? Hi! I will be staying at Tsim Sha Tsui and is planning on going to Hong Kong Ngong Ping 360 and Victoria Peak. Is it better & accessible if I do it in one day? Where should I go first? Hi there, getting to Victoria peak coming from Tsim Sha Tsui area is quite easy and lot of fun. Take the Ferry route Tsim Sha Tsui to Central and then follow the direction already mentioned above on how to get to Victory peak upon arriving at Central pier. The whole journey will only take about 30 minutes. Please take a look the interactive Hong Kong Star Ferry route map below. To navigate map, use the controls in the top left hand corner. Click the signs; (+) to zoom in and (-) to zoom out or move (<) left and (>) right or move (^) up and (v) down. You can also use your mouse by left clicking and then dragging in the direction of your choice. 1.) You can take the MTR trains from Tsim Sha Tsui station towards Central then take Central's MTR Station Exit J2, walk along Garden Road which is in between The Bank of China building and The Cheung Kong Centre. The walk to the tram station only takes about 15 to 20 minutes. 2.) Or, Take MTR trains to Admiralty Station and take Exit B, find Lippo Centre Bus Terminus and take the bus 12S. Hi there, I have read a page somewhere in this site with other visitor's inquiry which is related to yours. Here's the link on that page. We will be in Hong Kong this coming July 21 (10am) to July 24 (10pm). We plan to visit Disneyland,Ocean Park and other tourist attractions in HongKong. Also, we plan to take a one-day tour at Macau. RE: baby and stroller in cable car? YES, the floor of the platform is specially designed to level with that of the cabins. Strollers for babies or wheelchair bound passengers can easily go onboard. To provide further convenience to them, the seating bench in the cabin can be lifted up, creating ample room for them. Also, for the visitors' convenience, there are luggage storage facilities for visitors arriving at Tung Chung Cable Car Terminal. There are about 20 lockers for rent. The size of each locker is 84cm (H), 40cm (W), 87cm (D) The rates are HK$20 for every three hours or HK$70 for one day. Please contact staff when you arrive at Tung Chung Cable Car Terminal for more details. baby and stroller in cable car? We are coming to Hong Kong in April with our 10-month old baby. Is Ngong Ping not too stressful for the baby? Are babies and strollers allowed in the cable car? Answer: Yes, it is very doable. Transportation between these cities are very efficient and will only takes about an hour or two. Answer: Going to Victoria Peak from Tsim Sha Tsui. The Ferry Pier is located in East Tsim Sha Tsui, could be a walking distance from your hotel. Get on board for an 8 minute Ferry ride to Central, Hong Kong Island(HK$2.20 - upper deck seat). Upon arriving at Central Pier, you can find a Bus station nearby, take Bus no. 15C (3.20 HK$) that will bring you to the Victoria Peak Tram station. Get on the Peak Tram (HK$25 - single, HK$36 - return) that will bring you directly to the Peak. I think we already stated above the directions in getting to Ngong Ping and Disneyland. Answer: The best way to do is to get a China (Shenzhen) VISA from your country otherwise VISAS can be acquired in the china borders. Short stay VISA will cost only around HK$150. Please find answers to your questions below. Hope this help. a) How long will the ferry take from Mui wo to central Pier? Ans: Ferry from Central Pier to Mui Wo takes 50 mins (ordinary Ferry) or 30 mins (fast Ferry) - Ferries operate at approx 40 mins intervals. Please see Ferry time table in here. b) Is there any bus or any transport from the bronze buddha to the Mui Wo Pier? If yes, (how long will it take) Or do i have to take the cable car back to the terminal so that i can grab a taxi to the pier? Ans: Yes, there is a bus. Route 2, from Mui Wo Ferry Pier to Ngong Ping (Big Buddha), on Lantau Island and about 45 mins travel time. c)I'll be bringing my 2 yr old son... Will they allow strollers on the ferry? Ans: Yes, they allow strollers on the Ferries. For more details about Ngong Ping and getting there, please read our page here. I am visting Ngong Ping 360 in Jan 2010. I intend to take your suggestion of taking a ferry from Mui Wo to Central Pier. However, I have to few questions to clarify. Hope you be able to help me. a) How long will the ferry take from Mui wo to central Pier ?? b) Is there any bus or any transport from the bronze buddha to the Mui Wo Pier ?? If yes, (how long will it take) Or do i have to take the cable car back to the terminal so that i can grab a taxi to the pier ?? c) i be bringing my 2 yr old son... Will they allow strollers on the ferry ?? If you want to go straight to Victoria Peak from Ngong Ping 360, I would suggest you take the Ferry from Mui Wo, Lantau Island to Central Pier 5, Hong Kong island. In Lantau island, just take a taxi to the ferry pier in Mui Wo. Here's the link to the complete ferry fare and schedule. Upon arrival in Central pier, take the Bus no. 15C nearby to the Peak Tram that will bring you directly to the Peak. how bout the other way around? how can i get to victoria peak from ngong ping? thanks. Recommended itinerary for 2 whole days in hongkong and 1 day in macau. Get on Airport Express trains to Tsing Yi then Sunny Bay station and interchange MTR trains to Disneyland Resort Line towards Disneyland. A great way to reach Disneyland from the airport is to take any A or E Hong Kong Bus to the Lantau Link Toll Plaza, 13 mins - HK$ 21 then interchange bus to Route R8 for Hong Kong Disneyland (HK$7). Spend at least 5 hours in Disneyland. Get on MTR trains to Sunny Bay then to the next station Tung Chung. Take the cable car - a 24 minutes stunning ride and unforgettable views of Hong Kong experience to Ngong Ping Village. Spend at least an hour over there and then get back to Tung Chung. Evening: (Ngong Ping 360 to Avenue of Stars @ Victoria Harbour (to watch the must-see Symphony of Lights). Take the MTR trains to Lai King station then Tsim Sha Tsui station. Take a walk along the waterfront between the Avenue of Stars and the Hong Kong Cultural Centre. You can spend the whole evening in this area (before going to your hotel) where you can watch the Symphony of Lights (nightly show) that will start at 8:00 pm. I suggest you book your hotel somewhere in Tsim Sha Tsui area for an easy access. Most of the popular Hong Kong Museums where also in Tsim Sha Tsui area and are close to each other. Please refer to our Hong Kong Museum page for complete details on how to get there with their respective schedules. You can spend your time in any of those recommended museums until late afternoon as your next journey is the "Peak" and it is better to go up there and best viewed during sunset or early evening. Get on board of the Star Ferry then Bus no. 15C and then get on the Peak Tram that will bring you directly to the Peak. It is only about 20 minutes travel from the Peak to Shun Tak Centre, the Hong-Macau Ferry Terminal. Day 3, Dec 8 Macau tourist attractions. Whole day! I will be in hongkong with my friend on December 6 to 8,2009,we will be arriving at 7:30am in HKIA and we will leave at 10pm in HKIA on Dec 8. Can you please advise me on our itinerary for 2 whole days in hongkong and 1 day in macau? We want to visit Hk Disneyland,Victoria Peak,Ngong Ping 360,Avenue of Stars,Victoria Harbour and HK Museum, is it possible? Me and my parents will visit Hong Kong on June 3-6.